ence of alcohol in urine and provide an approximation of relative blood alcohol concentration. This test provides a preliminary screen only. A more specific alternate chemical method must be used in order to obtain a confirmed analytical result. Clinical consideration and professional judgment should be applied to any test screen result, particularly when preliminary positive screens are indicated. Two-thirds of all adults drink alcohol.¹ The blood alcohol concentration at which a person becomes impaired is variable dependent upon the individual. Each individual has specific parameters that affect the level of impairment such as size, weight, eating habits and alcohol tolerance. Inappropriate consumption of alcohol can be a contributing factor to many accidents, injuries, and medical conditions. Allow the pouched dipstick to equilibrate to room temperature (15-30°C) prior to testing. By collecting cup collect a cup of urine. Open the foil package and remove the test dipstick. Observe the reactive pad on the middle of the test dipstick. If the reaction pad has a blue color before applying urine sample, do not use. Saturate the reactive pad with urine from collection cup or by applying urine directly to the pad. (It usually takes 15 seconds to be saturated.) Start timer immediately after urine application. The results within 3-5 minutes to read. Compare the color of the reaction pad and standard than color card to determine the relative blood alcohol concentration. Positive: The Urine Alcohol Rapid Test Dipstick will produce a color change in the presence of urine alcohol. The color will range from light blue color at 0.02% relative blood alcohol concentration to a dark blue color near 0.30% relative blood alcohol concentration. Color pads are provided within this range to allow an approximation of relative blood alcohol concentration. The test may produce colors that appear to be between adjacent color pads. 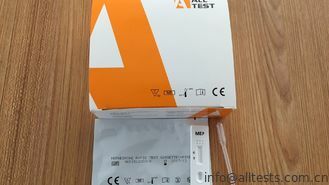 NOTE: The Urine Alcohol Rapid Test Dipstick is very sensitive to the presence of alcohol. A blue color that is lighter than the 0.02% color pad should be interpreted as being positive to the presence of alcohol in urine but less than 0.02% relative blood alcohol. 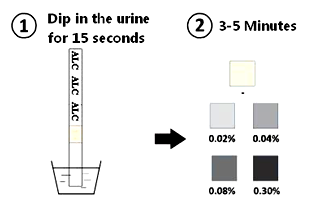 Negative: When the Urine Alcohol Rapid Test Dipstick shows no color change this should be interpreted as a negative result indicating that alcohol has not been detected. Invalid: If the color pad has a blue color before applying urine sample, do not use the test. NOTE: A result where the outer edges of the color pad produces a slight color but the majority of the pad remains colorless the test should be repeated to ensure complete saturation of the pad with urine. The test is not reusable. The Urine Alcohol Rapid Test Dipstick is highly sensitive to the presence of alcohol. Alcohol vapors in the air are sometimes detected by the Urine Alcohol Rapid Test Dipstick. Alcohol vapors are present in many institutions and homes. Alcohol is a component in many household products such as disinfectant, deodorizers, perfumes, and glass cleaners. If the presence of alcohol vapors is suspected, the test should be performed in an area known to be free of vapors. Ingestion or general use of over-the-counter medications and products containing alcohol can produce positive results.